Cooking fish the Mediterranean way in a parcel (en papillotte or cartoccio) allows it to cook in its own steam, resulting in a moist and lightly cooked dish. 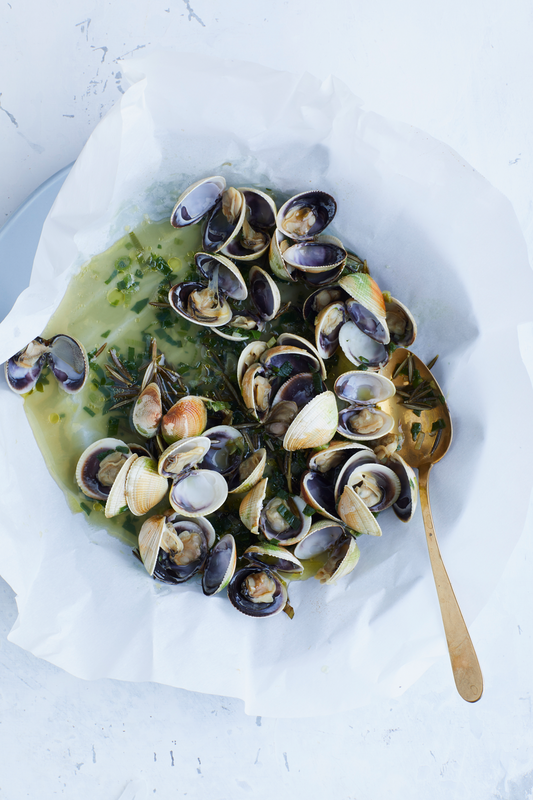 These shellfish pouches can be cooked on a barbecue or in an oven, bringing the flavour of holidays to your table. 1 Take a large 30cm square of baking parchment for each parcel. On one side, place your mixed herbs and spring onions, season and drizzle with a little oil and lemon juice or wine. Lay the shellfish on top, drizzle over the remaining oil and lemon juice. 2 Fold the paper up and over the filling, and pinch all the way round to secure, tucking the corners under a couple of times to ensure the parcel is thoroughly sealed while leaving plenty of space in the parcel for air to circulate evenly during cooking. If you’re barbecuing them, wrap a sheet of foil around the parcel too, taking care not to squash it. 3 To barbecue: ensure the charcoal grill is medium hot (your hand over the coals should be comfortable for about five seconds). Place the parcels on a grill rack and cook for 3–4 mins until you start to hear the juices bubbling. Cook for another 5 mins with the lid over the barbecue. Take off the heat and set aside, unopened, for 5 mins. 4 To cook in the oven: preheat to 200C/ Fan 180C/Gas 6, place the parcels on a baking tray and cook for 20 mins. Take out and check the cockles or clams have opened or prawns are bright pink. Remember it will continue to cook when out of the oven. Stand for 3–5 mins. Recipe from Mediterranean by Susie Theodorou (Kyle Books). * You can replace the shellfish with 175g fish such as sea bass, mackerel or salmon (about 1.5cm thick, keep skin on). Cook until fish is just flaky.